In April, we pressed ahead with the“Potato Project” in the wrong season. 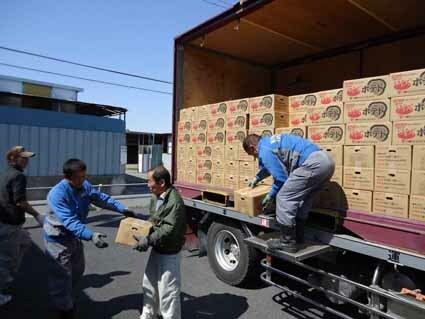 At the beginning of April, three Y’s Men’s Clubs in Sendai were told that The Tokachi Y’s Men’s Club in Hokkaido would like to present 400 boxes of “Tokachi Potato” to the affected area. The “Tokachi Potato” is like a seasonal event for the YMCA. The three clubs assisted with the transportation cost and The Sendai YMCA Earthquake Support Office helped to arrange the delivery places and delivered them. On the 19th of April, a container truck of Nippon Express Corporation arrived at the Naruse Support Center in Hibiki Industrial Park, Higashimatsushima City. Half of them transshipped to the 2 ton-truck which was prepared in Sendai and rest of them piled up in front of the center office. We asked the office to deliver to 13 temporary houses in Hibiki area, we went to Ishinomaki by the 2 ton-truck. After delivering potatoes to the Watanoha temporary houses and Tachimachi Fureai Shopping Avenue, we arrived in Sendai. 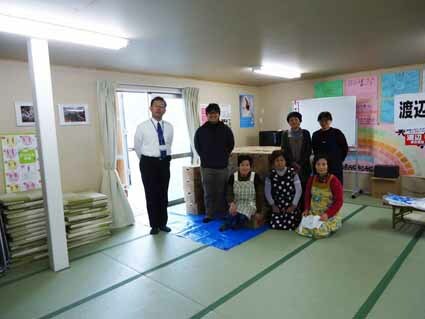 The Y’s Men’s Club in Sendai made arrangements to deliver potatoes to seven temporary houses and hubs for assistance. At last, we finished the “Potato Project” after delivering to two “Strawberry Farms” which always gave us work activities.